C3, which has picked up a staggering 29 awards* to-date, is recognised by its highly customisable character and the very latest automotive technologies - including a world premiere for ConnectedCAM Citroën™, an on-board HD camera that allows drivers to share their road-trip photos and videos directly with friends and family. One of the most significant additions to C3’s standard extras is the introduction of rear parking sensors across all trim levels. C3 is now the only car in the B-segment offering rear parking sensors as standard in the Irish market. The Citroën C3 was just one of seven finalists for Europe’s Car of the Year 2017, testament to its chic appeal. It is everything you would expect a modern Citroën to be – colourful, stylish, brimming with new technologies, supremely comfortable and with a bold, fun-loving personality. Starting at just €16,395, the 2018 TOUCH grade receives a significant uplift in equipment levels with electric heated door mirrors, rear parking sensors, black wheel arches, sideskirts and front fog lights; in addition to the existing features such as a USB socket for media streaming & Bluetooth handsfree, safety features including Lane Departure warning and coffee break alert, as well as comfort features including cruise control and power steering. Stepping up to the top-selling FEEL, from €17,995, will now incorporate Airbump’s® and bi-tone roof as standard. This is in response to customer demand as 90% of Irish C3’s are sold with this Style Pack that was optional. The upgrade will also bring brushed aluminium gear knob; in addition to the high level of standard equipment already on this grade such as 16-inch alloy wheels and LED daytime running lights; more intelligent and useful technology including Mirror Screen with Apple Car Play and a 7-inch touch screen; and the added comfort of automatic air conditioning. 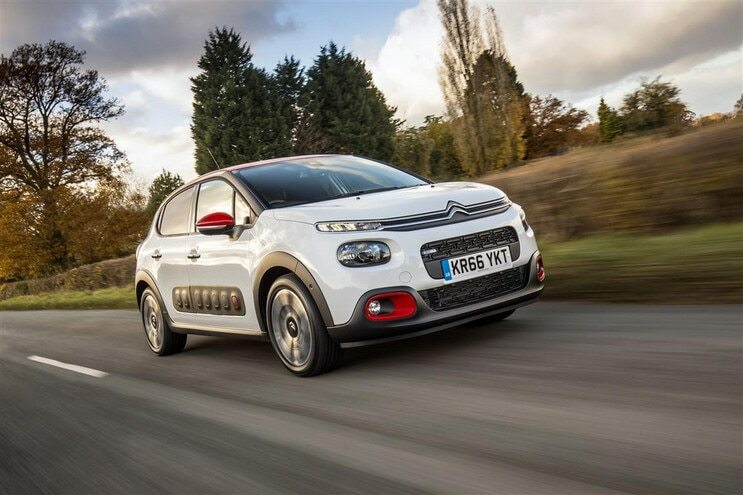 Sales of the New C3 have concentrated on the PureTech family of three-cylinder petrol engines which represents a real technological breakthrough for the modern petrol engine, and has won the International Engine of the Year in 2015, 2016 and 2017. 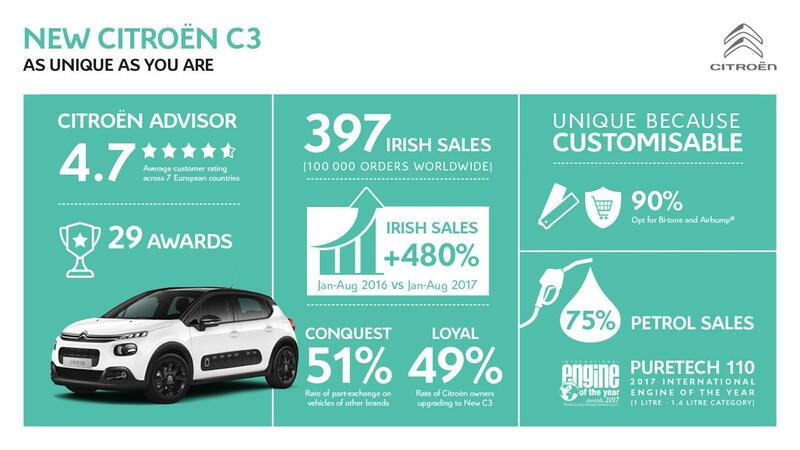 75% of sales of C3 are now petrol; reversing the traditional dominance of diesel sales in this segment for Citroën in Ireland.